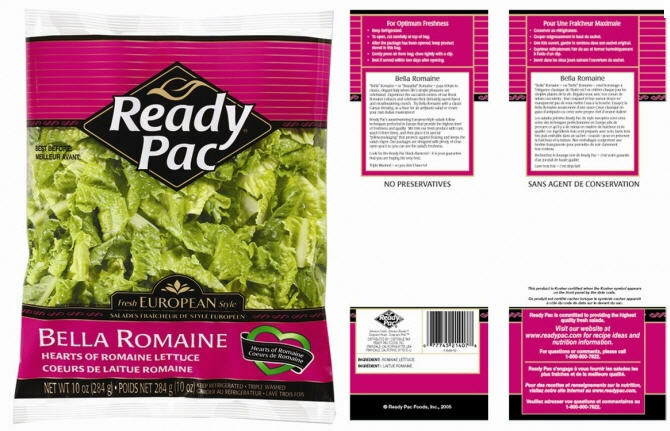 On November 16th, 2011, Ready Pac Foods, Inc. of Irwindale, CA recalled a total of 5,379 cases of bagged salad products containing Romaine lettuce due to potential E. coli contamination. This voluntary recall was initiated based on a single positive random sample result for E.coli O157:H7 reported to Ready Pac by the FDA. Ready Pac is fully cooperating with the FDA on this recall and it extends only to the products listed on the FDA website with a Use-by Date of November 18th, 2011 and sold in the following states: Alaska, Arizona, California, Colorado, Hawaii, Idaho, Montana, Nebraska, Nevada, New Mexico, Oregon, South Dakota, Texas, Washington, and Wyoming. These products were distributed at Raley’s,Trader Joe’s and Safeway stores. No other Ready Pac Foods, Inc. products are included in this recall. As of November 16th, 2011, no illnesses related to these products have yet been reported. What should you do if you still have some of this product? Because it is still possible that products bearing the Use-by Date of November 18, 2011 could still be on store shelves, this recall extends to retailers as well as consumers. Ready Pac believes that it is important to alert consumers and retailers who might still possess one of the potentially affected salads to dispose of it immediately. You should first check the product in your refrigerator for a Use-by Date of November 18, 2011 and then cross check it on the FDA website where the Product Description & UPC codes lists are displayed. The Use-by Date can be found in the upper left hand corner of the package with the UPC numbers located on the back side of the bag. Consumers who may have purchased the affected product are asked to record the Use-by Date and UPC number, immediately dispose of the product, and contact the Ready Pac Consumer Affairs representative, toll-free at (800) 800-7822, Monday – Friday, 8 a.m. to 5 p.m. (Pacific Time) to obtain a full refund. Ready Pac Foods has already notified all of their retail customers who have received the product in question and directed them to remove it from their shelves.